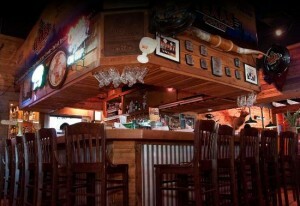 The Texas Roadhouse restaurant in Amarillo Texas is a great place for us to enjoy happy hour. They also have a fantastic steak or rack of ribs. We are usually traveling through Amarillo on our way to California or on our way home. There are several things that we particularly like about this location which we will cover in this post. It is located just off of I40 near the central part of the city and easily found on your GPS or by the signs that are along the highway. Since we are traveling by car we are looking for a hotel and a place to eat at night that is not far away. This Texas Roadhouse fits our requirements perfectly. There is a Holiday Inn Express on Wolfin Ave, just across the parking lot from the restaurant. We can check into the hotel and then head over for happy hour at the bar of the restaurant. There are others not too far away, however we also really like this Texas Roadhouse for several other reasons. We always sit at the bar so that we can enjoy the sports showing on several TV’s that are usually mounted over the bar. We also like to be able to sit and chat or meet some of the people around the bar. After travailing for many hours we look for conversation with other people that are either local or are traveling like us. The beer is ice cold served in frozen glasses right out of the freezer. They have peanuts in the shell to munch on as you relax after a day driving or work. We also find that they have the best steaks and ribs. They are cooked to perfection and the meat falls off the bone for the ribs. Matched with a baked potato and a Cesar salad and you have a great meal. The portions are large so depending on how hungry you are, you may want to share a rack of ribs with your partner. For more posts about the great state of Texas, click here.